Log cabin house plans are rooted in America’s history being built first by settlers and pioneers along the American frontier during Westward Expansion. At that time, they served as a simple source of shelter and were constructed with logs from trees native to the area. Log cabin home plans became popular again near the end of the 20th century offering a rustic alternative to modern living. Many of today’s homeowners build log cabins as a secondary residence, such as a hunting or fishing retreat or a vacation getaway. 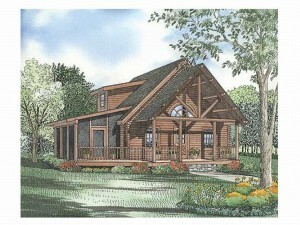 Like the log cabins of old, today’s designs are primarily built with white pine longs or logs native to the region. They showcase a rustic exterior blending well with their natural surroundings, and some may include the use of other natural materials such as stone. 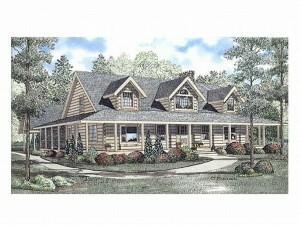 Cabin designs like those offered at The House Plan Shop generally offer less than 1200 square feet of living space. Due to their small size and their ability to fit into the surroundings almost anywhere, log cabin house plans are closely related to vacation homes, mountain house plans, log homes and other cabins and cottages. Most log cabin floor plans are fairly simple featuring one or two bedrooms or a bedroom and a sleeping loft along with one or two baths. Typically, the kitchen is a compact design providing just the basics and the living and dining areas are combined. Occasionally log cabin house plans include a few thoughtful extras like a stackable washer and dryer unit, a fireplace and a covered porch or deck. Whether you are looking for a hunting cabin for you and your buddies, a peaceful fishing retreat near your favorite lake a vacation cabin for outdoor and adventure sporting trips, log cabins are practical, cozy and comfortable accommodating your needs no matter what they might be. Modern day log home floor plans have come a long way since their primitive log cabin cousins once dotted the American frontier. Today, many home owners dream of having their very own log home. For some, the rustic styling and architecture is appealing. For others, log homes are more environmentally friendly than those made of manufactured materials. Still others have their own unique reasons for wanting to build a log house. If you are considering building a log home, take some time to review these thoughts covering a broad range of topics from energy efficiency to décor. Then, browse The House Plan Shop’s extensive collection of floor plans ranging from log cabin floor plans to robust dream log homes. 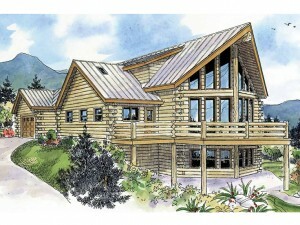 · Today’s log homes are generally comfortable and spacious, sometimes elegant. Those of the 1800s reflected the hardships of life on the North American frontier. · Log homes are built with natural materials including logs and stone that allow the home to blend seamlessly with nature and the surrounding landscape. · Log house plans encourage the enjoyment of nature and often incorporate decks, screened porches and large windows for taking in the sights and sounds of nature. · They are typically built on wooded lots and properties with natural views. · Log homes are often built to enjoy surrounding natural beauty, so skip the window treatments and let nature spill inside. If you absolutely must have window coverings, consider built-in blinds and simple cornices that will not detract from or block stunning views. · Consider energy costs before purchasing a floor plan. Choosing a log home plan with fewer intricate or special design features, such as two-story ceilings, will reduce energy costs. · Log home designs with a simple roofline and few corners and angles will reduce material and construction costs. · Log home floor plans with smaller square footages and efficiently divided rooms are more economical to build. · Log homes require regular maintenance to protect the logs and ensure structural integrity. · Natural décor and furnishings enhance the rustic living experience of a log home such as wood furnishings and log furniture, antler chandeliers, stone fireplaces, wood flooring and woven rugs. · Accent your furniture with various textures such as a leather pillow, a cedar chest or wool throw blanket. · Natural decorating themes are common in log homes such as wildlife, pinecones and water. · These homes offer all the modern day amenities of traditional houses from walk-in closets and gourmet kitchens to private master baths. 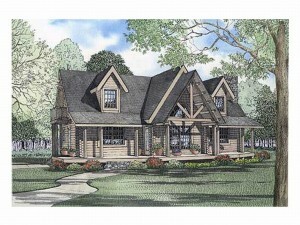 · Log home plans offer a distinguished look far from the cookie-cutter homes predominant in most neighborhoods. · Log house are mighty, sturdy and enduring – timeless when compared to today’s trendy building and decorating fads. · If you’re not quite sure if a log home is for you, consider staying in a vacation rental for a couple of nights such as a long weekend to experience what it is like to live in a log house. Taking time to consider various aspects of log house plans and log home living will help you decide of what size and style log home will be right for you. Whether you are thinking about building a permanent residence or a cozy wooded getaway, your mind might easily drift to a log home or cabin. So why do we like them so much? Before you build your new home or your weekend retreat, consider the following reasons why people like log homes. Who knows, you might just decide to build one yourself. Natural Beauty: Having a natural look, log homes and cabins offer a sense or calmness and peace, counterbalancing our busy lifestyles. Blend with Nature: A log exterior complemented with stone accents helps the home blend with its natural surroundings while removing us from the hustle and bustle of suburban living. There is something about a rustic look that makes us feel like we are a million miles from civilization. Furthermore, designs with large decks and covered porches encourage us to take in panoramic views and submerge ourselves in the sights and sounds of nature. Simplicity: Cabins and log homes are designed with simple style and few details. Usually, the exterior is not complicated lending to low maintenance and simple yet stylish street appeal. These homes look good, yet require little effort and upkeep on our part. Open Spaces: A log home designed with exposed beams, vaulted ceilings, large windows and an open floor plan inside delivers an easy and relaxed lifestyle. With few walls and sweeping views we feel a sense of spaciousness instead of that confined feeling we often have in a traditional home. Comfort: Nothing says comfort like a big stone chimney outside and a toasty hearth inside. It is easy to imagine ourselves relaxing in front of the fireplace with our kids and other loved ones sharing snacks and a movie on a wintry night.